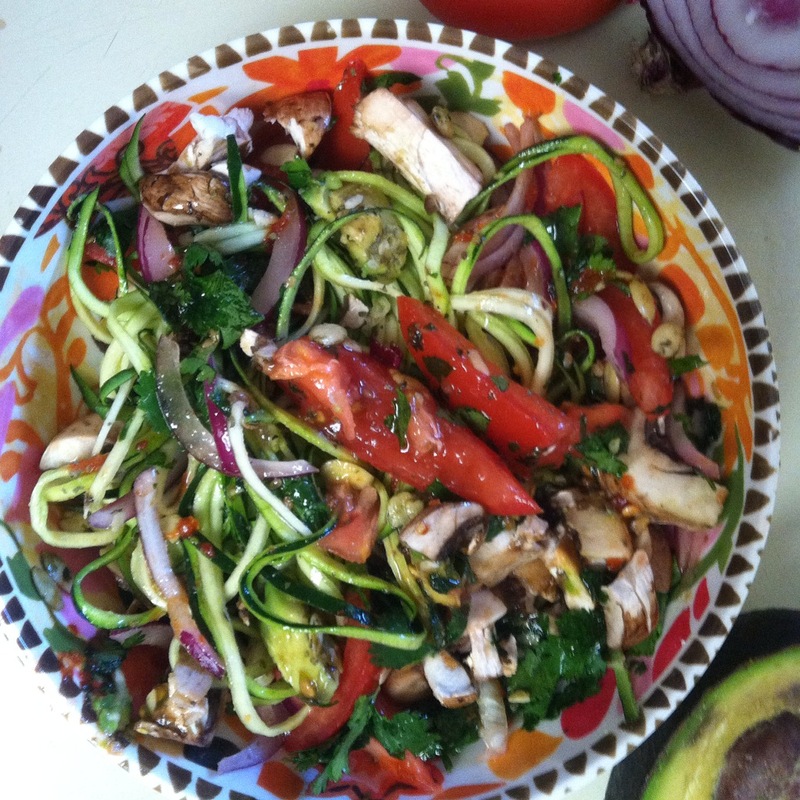 Simply spiralize the zucchini into a bowl and then season with salt, dressing, chili, lime, and cilantro. Add the remaining ingredients and top with cubed cheese if you like or just go fully raw! We are all familiar with this well known saying about an apple a day but do we know why? We know apples are a good source of vitamin C, potassium, magnesium, fiber, and carbohydrates. Some other benefits with eating apples are vitamins K, B6, boron, pectin, and natural sugar for energy. But are these the only reasons? No. These nutrients are actually just the surface of an “iceberg” of elements contained in apples, and for that matter, elements in all fruits and vegetables. Apples and other fruits and vegetables contain thousands of phyto-chemicals whose names are almost nowhere to be found in books or would even be familiar to us. But these natural components all work together interdependently, like a huge team of doctors each with a unique function to build our health. That’s a lot of doctors! What nutrition researchers have been doing for far too long is looking at single components in food. What they should be doing is focusing on how these phytonutrients interact as a “whole.” Analyzing nutrients in an isolated sense will not only leave “holes” in discovering their full potential, they will likely produce an incomplete effect on the body and our health. For the most part, this “standard” of research in isolating nutrients has been part of the problem in the field of nutrition. As a result of these studies, self interested food companies have been successful at selling us processed and packaged food and supplements marketed with a good source of (pick one!) nutrients such as vitamin A, C, calcium or fiber. In the end, we’ve become obsessed with these “parts”for the sake of convenience. Much to our loss, extracting or manipulating nutritional components as an attempt to “improve” what we eat would be like removing the door from a house. What can our body do with just a door?? Protection from disease requires the whole house! Enriching our food with isolated “plant fragments” may be helpful to a certain point, but it doesn’t provide us with optimal nutrition for preventing disease. The bottom line, is we will never get ALL of the nutrients, phytochemicals, and their interactions with each other from any vitamin bottle as we would from real food. So long as research scientists continue to work in this way of evaluating single pieces of the puzzle instead of gaining knowledge with the “bigger picture,” medical schools, hospitals, and government agencies will continue to downgrade the whole foods concept as the true path to health. As a matter of fact, identifying this whole foods “whole house” concept isn’t an unrealized theory either. We already have information on how we can multiply the nutritional value from our food through a strategy known as food synergy. Instead of thinking of food in terms of 1+1 equals 2, research has already shown us that combining certain whole foods such as tomatoes and avocado, apples and grapes, spinach and lemon, oatmeal and orange juice, turmeric and black pepper, broccoli and tomatoes, can actually equal to far more nutrition than we thought we could get. What’s been discovered about food synergy is just the tip of the iceburg. Researchers need to continue focusing on finding these food relationships in order to fully unleash the amazing power of our food. For now, its time we start thinking for ourselves and eat food in its original form as much as possible while ditching its manipulated and packaged profit selling version. An apple a day is a good start but on average, Americans only consume around 20 pounds of apples a year, around 1 apple a week. Nowhere near the ideal of everyday. But if we’re eating many other whole fruits and vegetables everyday, and in the right combinations, we will have enough “doctors” in the house! In a bowl, smash and whisk bananas until as smooth as possible. Add and stir in pumpkin puree, baking powder, vanilla, pumpkin spice, cinnamon, and brown rice flour until fully blended. Next, mix in rolled oats, coconut shreds, almonds, figs, and carob or chocolate chips. On a cookie sheet, drop and form cookies with about 2 tablespoons worth of batter for each cookie. Bake at 400 degrees for about 25-30 minutes. Edges should be golden brown. Lupita has a Bachelor of Science in Holistic Nutrition and has been vegan since 2011. For tips on eating a healthier plant based diet, new raw vegan recipes, and yoga practice tips, sign up today! Recipes at Vegan Health & Yoga! Get Raw Juice Recipes here! The Plantrician Project’s Plant Based Nutrition Resource Guide!